Last December the Warsaw airport handled 712.5 thousand travellers, 10.3% more than the year before – which means best December ever for Chopin Airport and the most rapid growth seen all year. Overall, throughout the entire 2014, 10.59 million people passed through the airport, only 0.87 less than in 2013. The majority of passengers, 9.373 million, travelled in international traffic. Only 1.217 million flied domestically. “It was a very good year for the airport. We served 10.6 million passengers without Ryanair, which shows a significant potential for growth,” commented Michał Kaczmarzyk, the director of Warsaw Chopin Airport. The biggest airlines operating at Chopin Airport in 2014 were: LOT Polish Airlines (4.55 million passengers carried, a 4% growth year-on-year) Wizz Air (1.2 million, a 16% growth), Lufthansa (475 thousand, down 8%), Enter Air (466 thousand, a 19% growth), Travel Service (342 thousand, a 16% growth). The most popular destinations to/from Chopin Airport were: London (a total of 759 passengers for all airports, down 18%), Paris (519 thousand for all airports, a 6% drop), Frankfurt (446 thousand, a 6% drop), Amsterdam (370 thousand, a 5% growth), Gdańsk (277 thousand, no change). In 2014 the airport served 1.525 million charter passengers (up 16.9%); 57 airlines performed a total of 9.4 thousand landings and take-offs from and to 167 cities all over the world. Five biggest charter carriers were: Enter Air (466 thousand, up 19%), Travel Service (342 thousand, 16%), Small Planet (243 thousand, 38%), Travel Service Polska (147 thousand, -20%), LOT Polish Airlines (108 thousand, 67%), whereas most popular non-scheduled destinations included: Antalya (143 thousand, 12%), Hurghada (91 thousand, 16%), Sharm El-Sheikh (72 thousand, 26%), Rhodes (65 thousand, 24%), Tel Aviv (64 thousand, -12%). The airport served 11.2 thousand passengers in general aviation traffic. GA planes performed 6.6 thousand aircraft movements, including 3.6 as part of international flights and 2.9 thousand on domestic routes. 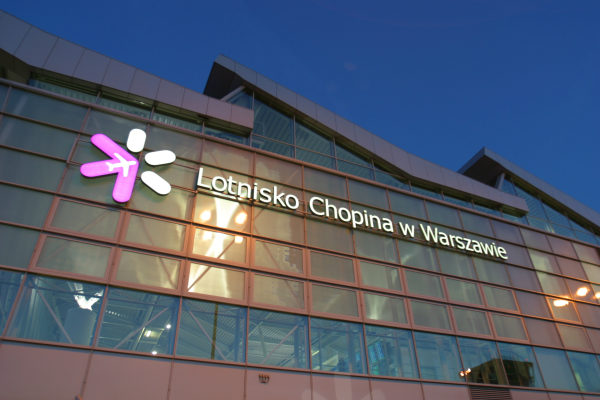 ‘Polish Airports’ State Enterprise, the managing authority of Chopin Airport, underwent a process of full-scale restructuring and downsizing in 2014. Employment was reduced by 800 persons, company structure changed, commercial policy and customer approach modified. As a result, operational costs were significantly lowered. “Cutting back on staff and introducing a new organizational structure allowed us to significantly boost the company’s economic efficiency and increase competitiveness among comparable airports in the region. Most importantly, the changes had no negative impact on the quality of passenger service and improved the standard of airline service,” explains director Kaczmarzyk. Mr Kaczmarzyk underlines that due to high one-off restructuring costs, the company will be in the red in 2014. But results are expected to be much better in subsequent years. “If our forecasts come true, EBITDA in 2015 will reach PLN 300 million and net profit should near PLN 100 million, with even better perspectives for the future,” he adds. It’s worth noting that 2014 saw the completion of several major development projects at the airport: a new cargo apron and two new de-icing aprons were built, as well as two additional taxiways. As of August Chopin Airport provides all its customers with free and unlimited wi-fi Internet access. The year 2015 promises to be even more fruitful. Airlines have officially announced the launch of 12 new regular services and three new charter routes. By the end of March Wizz Air will add a fifth aircraft to its Warsaw fleet and in July the airport will welcome a new carrier – the Dutch low-cost Transavia. “We are very pleased with such decisions. The wider the offer, the better for passengers, which is what we strive for. We are convinced that each subsequent year the number of travellers using the Warsaw airport will increase. This year we aim to serve more than 11 million people and we anticipate a further 5-6% growth in the two years to follow,” says Mr Kaczmarzyk. Growing traffic requires continual development and still more investments. Construction works at the old part of the terminal, which will be completely refurbished and fully integrated with the new part, are set to be completed between the end of Spring and the beginning of Summer. Also around this time of year the airport plans to finish the modernization of two parking aprons. On-going projects include building a railway fuel loading terminal and linking it to the airport fuel station with a view to increase competition on the jet fuel supply market.